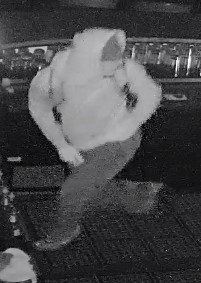 On Tuesday, January 22nd, 2019, at approximately 4:30 in the morning, two males in an unknown vehicle entered the Pilot Mound Arena parking lot and walked over to the Call-Inn’s Hotel & Wise-er’s Bar & Restaurant where one suspect was then seen on video surveillance inside the bar breaking the cash register and stealing money. Entry was gained by breaking a window, and the suspect seemed familiar with the layout of the building. He was wearing running shoes, camouflaged pants, light hooded sweatshirt, and had a light backpack with dark zippers. Anyone with information about this incident is asked to call the Manitou RCMP Detachment at (204) 242-2017.